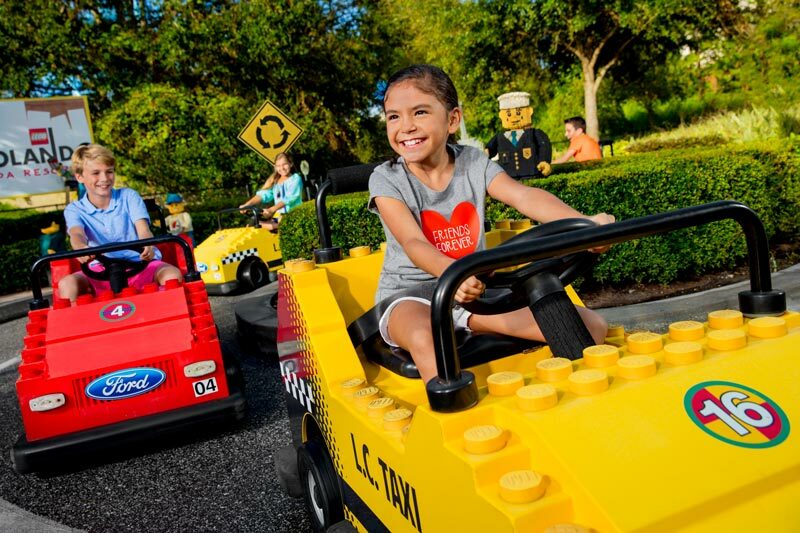 LEGO® fans, start your engines: LEGOLAND Florida Resort is your dream come true! The combination amusement and water park brings your favorite building game to life in ways you could never imagine. The self-proclaimed “5-gazillion star” hotel contains over 2,000 LEGO models, meaning you’ll never be far from these addictive building bricks throughout your stay. While LEGOLAND Florida is targeted at younger tykes aged 2-12, if you ever played with LEGO bricks as a kid, the sheer nostalgia of the place is enough to make it enjoyable for all ages. LEGOLAND Florida was built on the site of what was previously Cypress Gardens, a botanical garden that operated from 1936-2009. Merlin Entertainments took great pains to preserve the park and incorporate it into the LEGOLAND Florida experience; you’ll find the historic botanical garden in pristine condition. Learn all about the best time to visit, what options you have for accommodations, and how to save money when buying tickets, and get a general overview of LEGOLAND Florida Resort. When planning your trip to LEGOLAND Florida Resort, there are several things to keep in mind. For starters, it’s not located directly in Orlando. Rather, it’s in Winter Haven, Florida, which is about 45 minutes from both Tampa and Orlando. Factor this into your plans if you’re planning a day trip while staying in Orlando, as LEGOLAND Florida Resort is most conveniently accessible by car. If you aren’t staying at the resort’s accommodations, depending on how many days you plan to spend at LEGOLAND Florida Resort, you may want to consider renting a car for just the day to avoid overnight parking fees at your hotel. Planning a visit during the spring, summer, or fall months? 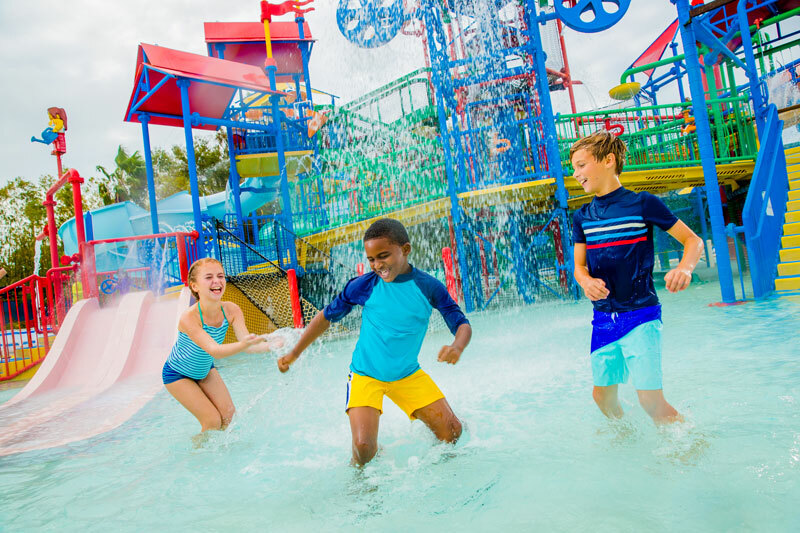 You may want to pack your bathing suit because LEGOLAND Florida Resort also boasts a water park open from March until October. Florida weather stays pretty balmy throughout most of the year, with average highs of 81 even in October, but the winters get a bit chillier, with average highs only reaching the mid-60s in the coldest months, and lows in the upper-30s and lower-40s. Plan to get rained on at least once if you visit during the spring and summer months, and hurricane season starts in late summer and lasts well into fall. With 13 lands to explore and a water park to boot, you could easily spend several days here, although one or two days is also plenty of time to make the most of your visit and have tons of fun. For a fun and free souvenir, trade minifigures (the tiny people in the LEGO sets) with the LEGOLAND Model Citizens (employees) who roam the resort. They will help you find whatever you need in the resort, and always have plenty of minifigures on hand to happily trade with guests. 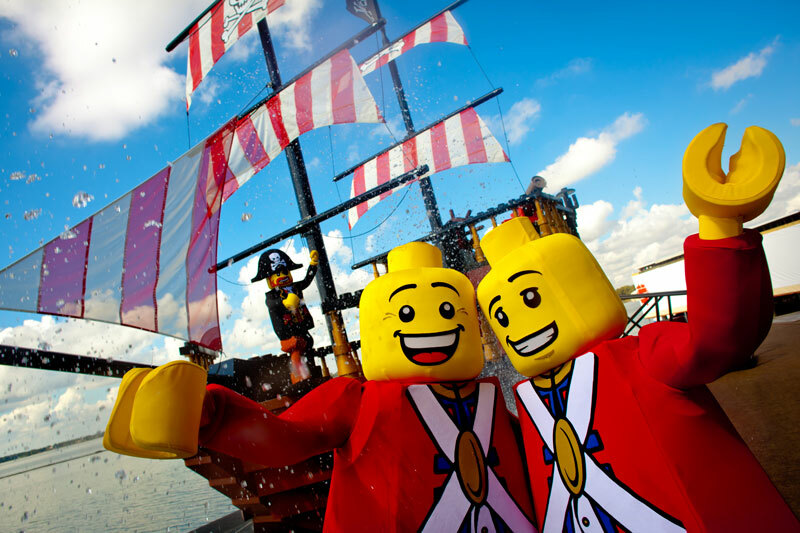 Check out LEGOLAND Florida’s Guide and FAQ page to learn more about how to plan for your trip. LEGOLAND Florida Resort is located at One LEGOLAND Way, Winter Haven, Florida. Hours of operation fluctuate depending on day of the week and time of the year, but generally range from 10am to 5pm or 6pm in winter, and from 10am to 6pm or 7pm in the warmer months. (Note they are closed on select Wednesdays in the off-season.) They also have special holiday hours, so make sure to check the LEGOLAND Florida website before planning your visit. 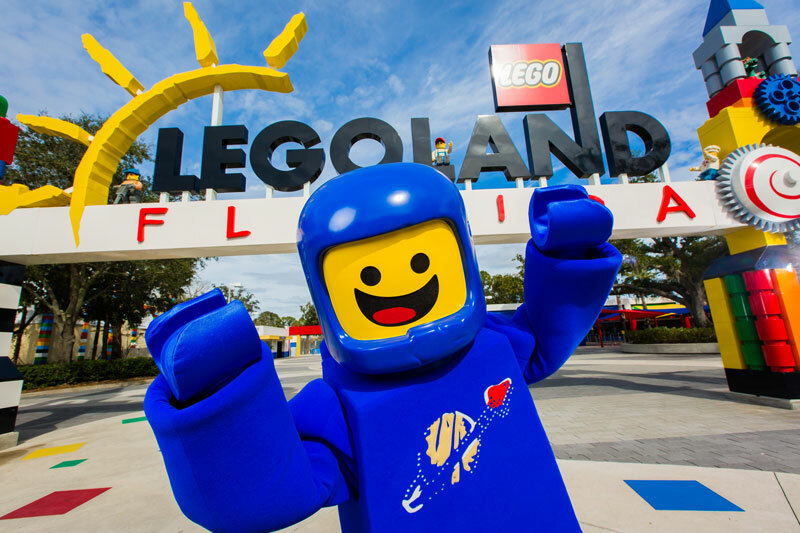 You can purchase tickets ahead of time online at the LEGOLAND Florida website, where you can choose from a variety of options including vacation packages and annual passes. 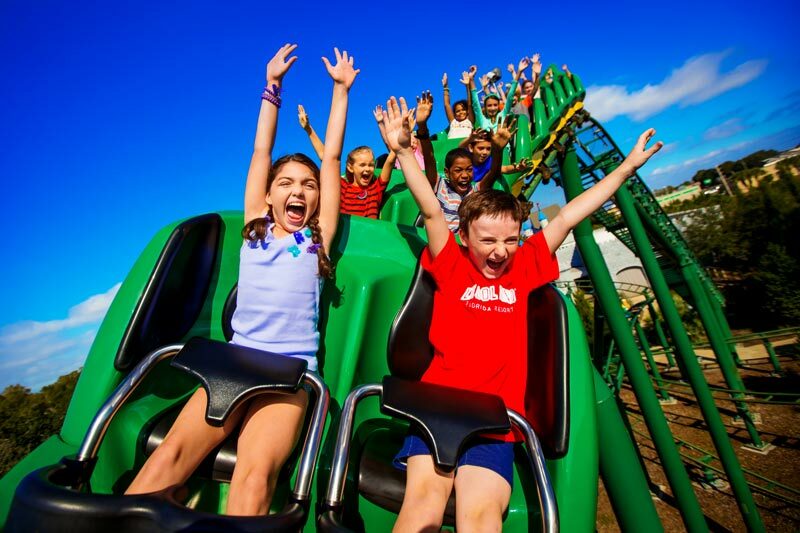 While LEGOLAND Florida offers some promotions to save money on entrance fees, if you’re planning to visit multiple theme parks, check out Orlando CityPASS tickets. You’ll get a great discount on tickets to Orlando’s top attractions, which means more money in your pocket for extra souvenirs or another splurge. Even though the target audience for LEGOLAND Florida Resort is children ages 2-12, it really is an enjoyable experience for the whole family. LEGOLAND Florida Park – A one-stop shop for rides, interactive play areas, and amazingly detailed replicas of some of America’s most amazing cities and states. LEGOLAND Florida Water Park – Rides that will cool you down under the hot sun, interactive play areas, and yummy kid-friendly foods abound at LEGOLAND Florida’s Water Park. LEGOLAND Florida Hotel – You’ll encounter LEGO at every turn in this whimsically designed hotel filled with LEGO models and themed rooms. LEGOLAND Florida Beach Retreat – Beach-themed bungalows with views of scenic Lake Dexter are grouped into 13 sections, each with its own outdoor play area. The resort has over 50 rides in total, including so-called “pink-knuckle” roller coasters that are tame enough for young ones but still offer a bit of a thrill, DUPLO® areas for toddlers, and even miniature LEGO reproductions of big cities. The Botanical Gardens can’t be beat for sheer natural magnificence, and there’s even a 4-D theater. The water park is filled with opportunities for splash-tastic fun and the hotel has on-site amenities like a free buffet-style hot breakfast, nightly model building competitions, and even a boardwalk that overlooks Lake Eloise. LEGOLAND Florida Park is filled with 13 intriguing worlds, each with its own theme. Enjoy verdant botanical gardens in Cypress Gardens, thrilling (but not too scary) rides in LEGO Technic™, or even chow down on warm Granny Smith apple fries smothered in whipped cream in Fun Town. If you need a breather from the hot Florida sun, you won’t have far to go. No matter where you are there are air-conditioned play spaces or shopping options nearby. You’ll also find ample opportunity to let loose and build anything you’ve ever wanted to out of LEGO bricks. The park has options for fun and entertainment for every age. The LEGOLAND Florida Park rides are as varied as the day is long. Choose between two driving schools for up-and-coming drivers, a safari trek, a plunging Egyptian freefall, and more. Kids and adults alike will love the variety and incredible creativity put into the rides. Some LEGOLAND Florida park rides have height and accessibility restrictions, so be sure to check the LEGOLAND Florida website when you’re planning your trip. Beetle Bounce – If you’re fresh from Pharaoh’s Revenge and craving more Egyptian entertainment, head over to Beetle Bounce, an exciting ride that launches upward 15 feet in the air and drops you back down without giving you a chance to catch your breath. Safari Trek – Animal lovers, hop aboard a zebra-painted car and prepare to be amazed by animatronic creatures that move and act like the real thing. The surprise is that these critters are actually made entirely out of LEGO bricks. Royal Joust – Clamber onto a LEGO horse for a trip through a medieval forest and the chance to witness enchanted beasts and competing knights. 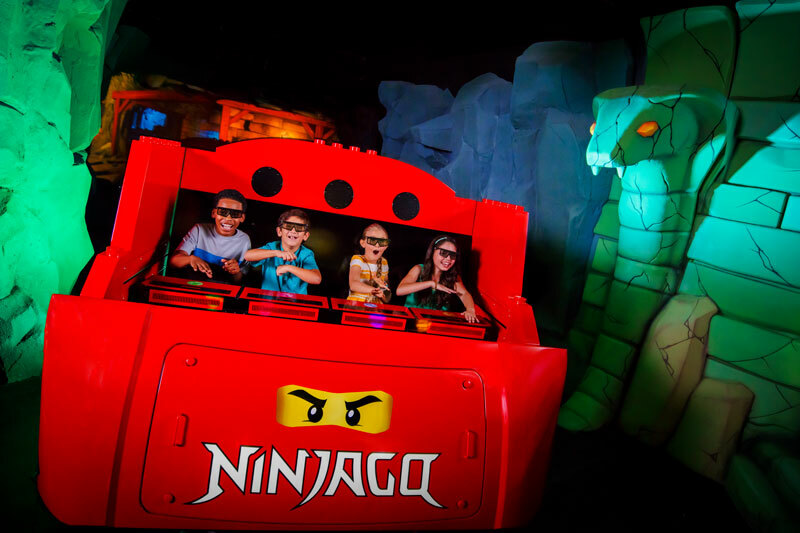 LEGO NINJAGO® The Ride – A virtual ride awaits where you’ll compete with other guests to blast enemies with fireballs and lightning. Flying School – Kick up your heels for a wild suspended coaster ride. Ford Driving School – Eager young drivers get a taste of the open road as well as a LEGOLAND driver’s license at this zany auto ground. THE LEGO® MOVIE™ WORLD – Experience the land of Bricksburg where the immersive world of THE LEGO® MOVIE™ comes to life with Unikitty’s Disco Drop, the Battle of Bricksburg and THE LEGO® MOVIE™ Masters of Flight. Heartlake City: Mia’s Riding Adventure – Join Mia and the LEGO Friends on a horse riding adventure! Pick your horse and saddle up for a thrilling ride on a disc coaster. The Great LEGO® Race – Start your engines! 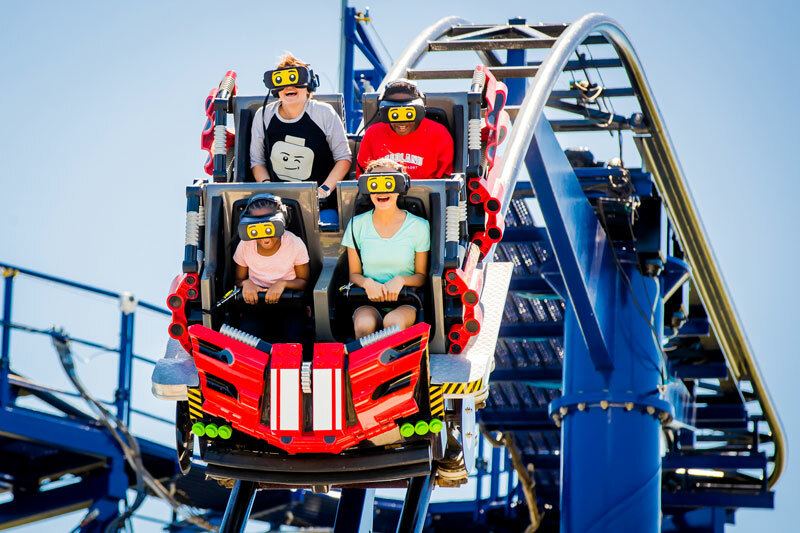 Prepare to take a ride on the wildest LEGO race ever imagined with fellow LEGO Minigifure racers when cutting-edge virtual reality (VR) technology is combined with roller coaster thrills in an exhilarating race to the finish line! The Dragon Coaster – Have a roaring good time, aboard a giant friendly green dragon, as you conquer the twists and turns of this indoor/outdoor steel roller coaster where it’s all about fun for the family. It’s virtually impossible to be bored at LEGOLAND Florida Park—there are so many things to do you’ll be spoiled for choice. If you’re looking for a bit of down time after a whirlwind of dizzying rides, check out some of these more low-key—and even relaxing—attractions at LEGOLAND Florida Park. Botanical Gardens – A beautifully maintained remnant of Cypress Gardens, the original garden attraction upon which LEGOLAND was built. MINILAND U.S.A. – Where else can you visit California, Las Vegas, Washington DC and New York City all in one day? MINILAND USA contains more than 32 million LEGO bricks and amazing scenes from coast to coast all the way to a galaxy far, far away! Creation Zone – A curvy corridor that kids can decorate to their heart’s content with LEGO bricks. DUPLO Splash & Play – A cushioned outdoor play area where young ‘uns can play amongst interactive water elements and friendly plastic farm animals. Kai’s Spinners – Get schooled in the art of Spinjitzu—a balance and vortex spinning discipline. LEGO Mindstorms® – Put your inner engineer to work to create computerized LEGO Mindstorms robots. Character Meet and Greets – Your favorite LEGO characters come to life for hugs and photos. Pharaoh’s Revenge – A maze through the Pharaoh’s Kingdom where enemies just begging to be pelted with soft foam balls await you. The Forestmen’s Hideout – A thrilling combination of ropes, tunnels, and ladders just begging to played with. Zane’s Temple Build – Embrace your inner Zen by helping erect the NINJAGO Monastery. Pirate’s Cove Live Water Ski Show – Shiver me timbers! Help Miranda Valentina defeat the nefarious Captain Brickbeard and stop his pirates from taking back his bounty. 4-D Theater – Catch a 4-D flick at this 700-seat theater featuring movies like LEGO® City 4D – Officer in Pursuit and The LEGO Movie™ 4D. Dragon’s Den – If you’re craving positively medieval treats, head down to Dragon’s Den for some seriously massive smoked turkey legs and bratwurst sausages. Fun Town Pizza & Pasta Buffet – Load up on tasty carbs at this all you can eat buffet, but save room for a slice of sweet dessert pizza after your meal. After spending several hours in the steamy Florida sunshine, you’ll probably want to cool down for a bit. You can do so in the most fun way possible at LEGOLAND Florida Water Park. A brilliant wave pool beckons when the heat gets to be too much, and kids and adults alike will get a kick out of multiple slippery slides and interactive water-play structures. When planning your trip, please keep in mind that the water park closes in late October for the winter and reopens in March. Check the LEGOLAND Florida website for details. Build-A-Boat – Head to Creative Cove to build your own LEGO boat, then race it against other guests. Build-A-Raft - Who can build the biggest, best LEGO® raft? You can! Imagine, design and build your own unique LEGO vessel. Joker Soaker – Little ones will love splashing around this interactive play area, which is full of cooling water spouts and intriguing climbing areas. There’s even a wading pool filled by a 300-gallon bucket. LEGO Wave Pool – No trip to LEGOLAND Florida Water Park is complete without a good dousing in the wave pool, where waves are gentle enough for younger guests but tall enough to make you feel like you’re in the ocean. Splash Out – Prepare for 60-foot drop into a deep pool at the end of this thrilling slide. Aquazone® Wave Racers – Man your own wave racer, weaving through the water to avoid water cannons and sending up shimmering sprays of water with every turn. While LEGOLAND Florida Resort is only 45 minutes from Orlando, if you want to get an early start at the park, you may want to book a hotel or find accommodations near Winter Haven. There are multiple hotels within close proximity to LEGOLAND Florida, as well as fun, themed hotels that are part of the resort itself. Regardless of whether you’re trying to stretch your vacation dollars or splurge on a place you’ll never forget, you’ll be able to find a hotel that’s perfect for you and your family. The LEGOLAND Florida Hotel spares no expense when it comes to creating a memorable experience for guests. There are over 2,000 LEGO models sprinkled throughout the premises, made up of over two million LEGO bricks. And that’s not all: the hotel rooms are all themed, so you can choose one that perfectly suits your style, from Adventure to Pirate to Kingdom. Every room comes equipped with a king adult bed and a child’s sleeping area, complete with a bunk and pull out trundle bed and an entertainment unit. Upon arrival, you’ll be treated to a Welcome Treasure Hunt with a complimentary LEGO prize, and all rooms are stocked with plenty of LEGO bricks for the guests to play with. All guests are welcome to a free buffet breakfast at the Bricks Family Restaurant each morning and receive free parking at LEGOLAND Florida. The other restaurant, Skyline Lounge, features fun mocktails for kids and a view of the LEGO skyline. Perhaps the most appealing part of staying at the LEGOLAND Florida Hotel is the abundance of nighttime activities. Kids will be thrilled to join LEGO Building Competitions, a pajama party, or take part in a Master Model Builder Session, where they’ll work directly with a Master Model Builder to create a one-of-a-kind LEGO masterpiece. If you’ve forgotten to bring your minifigures from home you can buy a few at the hotel to trade with Model Citizens during your visit for an inexpensive souvenir. Beach bums will adore LEGOLAND Florida’s Beach Retreat décor. Brightly colored bungalows boasting private shaded patios are grouped into 13 coves, all with separate themes named after a minifigure. Each cove has its own play area with climbing nets and balance beams, perfect for kids to burn off some energy. Just half a mile from the Park, this cozy village offers outdoor play areas in each section, a pool bar for adults and poolside activities for kids, and a full buffet breakfast option at Sandy’s Castle. Don’t miss The Lighthouse, an iconic structure that houses Sandy’s Castle, Bricks’ Beach Bar, a massive sandcastle-themed building area, and the Palm Tree Traders store. 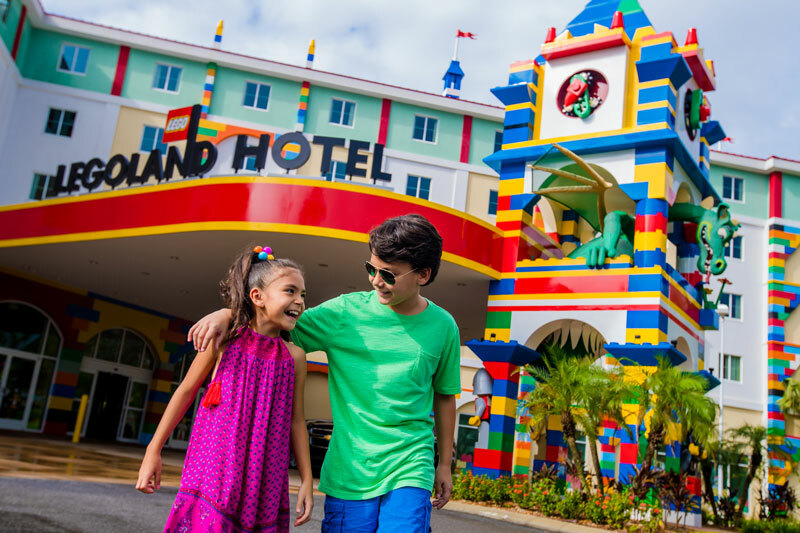 Doing some due diligence when planning a trip to LEGOLAND® Florida Resort may not be the most exciting part of your vacation, but it will save you a lot of time so you can enjoy your trip. Be mindful of height minimums on rides. One of the most important things to consider if you’re traveling with small children is that most of the rides have height minimums. Sometimes if a child is under a certain height the only thing required is a responsible adult to accompany them, but other times they will not be allowed on the ride. Check the website for each ride you are thinking of going on to ensure everyone will be able to enjoy it. Food restrictions within the resort. With plentiful food options available it’s unlikely you’ll go hungry during your visit, but if you prefer to bring your own food, keep in mind that bringing picnic lunches isn’t allowed for families, and glass containers are prohibited. For more regulations, check the website. Make the most of your stay. LEGO lovers should plan to spend at least two days at the resort if they want to visit the LEGOLAND Florida Water Park. However, truly die-hard fans could easily spend half a day just admiring the Miniland replicas, so use your best judgment when planning how long to stay. Peak hours for water park. LEGOLAND Florida Resort recommends avoiding the water park between 1-3pm (especially on weekends), as that is when it is most crowded. For the rest of the park, the same advice applies. LEGOLAND Florida is quietest during the school year, with the exception of the holiday season. Shady sanctuary around the park. Even if you’re not a nature lover, the Botanical Gardens are definitely worth a visit. Their tranquility is a welcome contrast to the hubbub of the rest of the park, and on a hot day the trees provide a welcome respite from the sun. Yes. The kids can drive, too. The Ford Driving School is a treat for kids who feel very grown up piloting their own vehicles down realistic streets. Receiving a "driver’s license" is the cherry on top. Take in the details. As far as attractions go, Miniland is a must. Countless hours were spent designing and building these incredibly detailed replicas, and you’ll get to experience a taste of the real thing even if you’ve never seen it personally. Pack your sunscreen! Finally, it goes without saying, but make sure you bring and use plenty of sunscreen. The tropical Florida sun can be unrelenting, especially in the sweltering summer months, and much of the LEGOLAND Florida Resort attractions are outside. No one wants to come back from a vacation with sunburn as a souvenir! Orlando is one of America’s top tourist destinations, bringing in over 70 million visitors per year. While its balmy weather, superlative theme parks, and world-class golf courses explain most of the appeal, it also has a significant number of other engaging activities. Go for a stroll around natural surroundings at one of many nature reserves or take a paddle-boat out on Lake Eola; take a balloon ride over the city; learn about the world around you at the Orlando Science Center; even visit the Kennedy Space Center. For those looking to visit multiple Orlando attractions including Walt Disney World® Resort, Universal Orlando Resort™, and SeaWorld® Orlando, CityPASS has just the ticket for you. You’ll save money and get to experience the best theme parks and entertainment Orlando has to offer. It’s a win-win deal!